Shoppers constantly search for the best: best product, best price, best reviews. 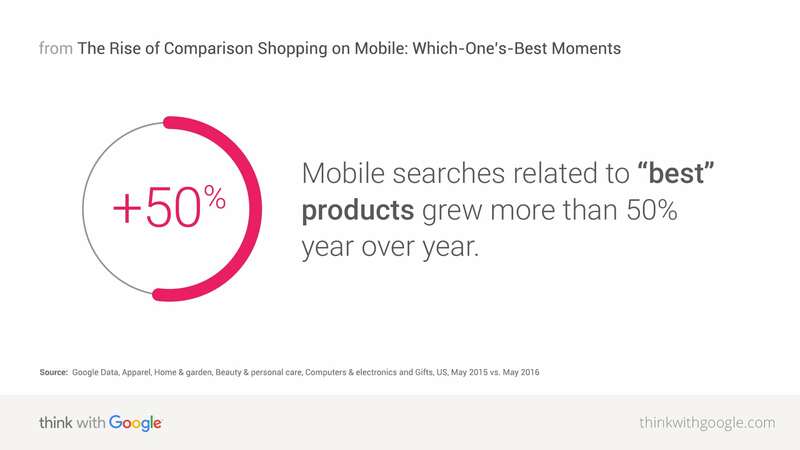 In part three of this five-part series on shopping micro-moments, we look at how shoppers increasingly turn to mobile to compare products—both in the store and online. The Nike running shoes or the Asics? The down pillow or the foam? The $59 headphones or the $199 pair? As today's shoppers narrow their options, comparing, contrasting, and conducting further research, they enter the realm of which-one's-best moments. When it comes to shopping research, we all know that online interactions play a role in influencing the ultimate purchase decision. But how much so? 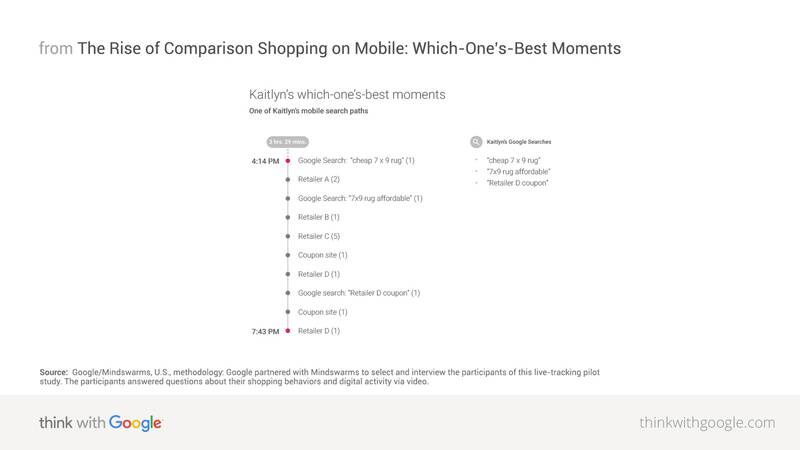 New clickstream data from Luth Research's opt-in panel5 (which shows the online pages a user visited) and Mindswarms mobile video surveys6 provide just that type of insight. By analyzing a shopper's micro-moments (in the form of searches, clicks, and website visits) over the course of one month, we can start to see exactly how and how much digital played a role in influencing her purchase decisions. Meet Kaitlyn, a 27-year-old from Wisconsin who frequently shops on her phone and regularly scouts online deals before making a purchase. Over a one-month period, Kaitlyn had nearly 1,000 retail interactions across a variety of sites, 89% of which occurred on mobile. During that time, she was on the hunt for some new yoga pants, a new area rug, and some personal care products. 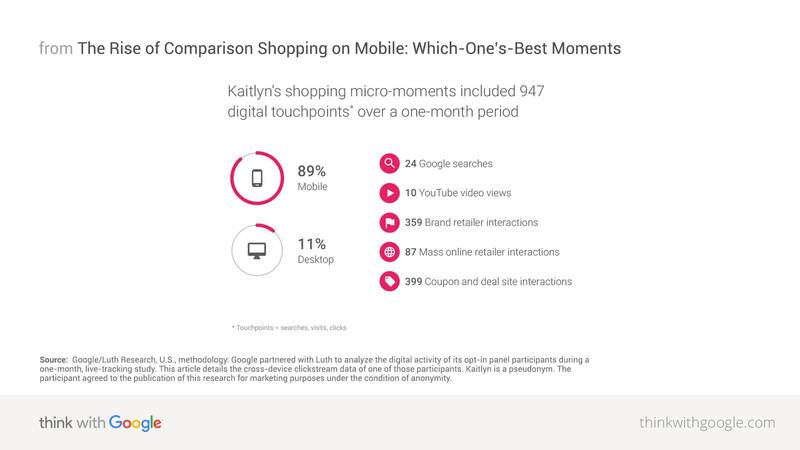 Here's a high-level look at the digital touchpoints (searches, visits, and clicks) that shaped Kaitlyn's shopping micro-moments that month. Source: Google/Luth Research, U.S., methodology: Google partnered with Luth to analyze the digital activity of its opt-in panel participants during a one-month, live-tracking study. This article details the cross-device clickstream data of one of those participants. Kaitlyn is a pseudonym. The participant agreed to the publication of this research for marketing purposes under the condition of anonymity. Kaitlyn was on the hunt for two new area rugs for her home. She wanted affordable rugs that were 7x9 in size and relatively neutral in color. After searching on Google for both "cheap 7x9 rug" and later "7x9 rug affordable," Kaitlyn compared her options on four different retailers' sites. She ended up purchasing one rug on Retailer D's mobile site, where she was able to find a discount and use a credit she had. Feature product reviews. Make it easy for consumers to choose you by letting others speak on your behalf. If you gather product reviews on your site, highlight your reviews in the form of stars on your Shopping ads to make your products stand out. Promote your best sellers. Once on your site, consumers may still grapple with making the right decision. Promote your best sellers on desktop and mobile to guide those who may not know how to distinguish between two lengthening mascaras or two different brands of SLR cameras. Feature products in context. Just like it's easier to sell a home that's staged, it's easier to sell purses, dining room furniture, or jewelry (or ... anything) when you show the products in use. In fact, 64% of women who shop for apparel on their smartphone agree that seeing images of products in context positively influences their purchase decision.7 Highlight the product in context either through multiple images or video. 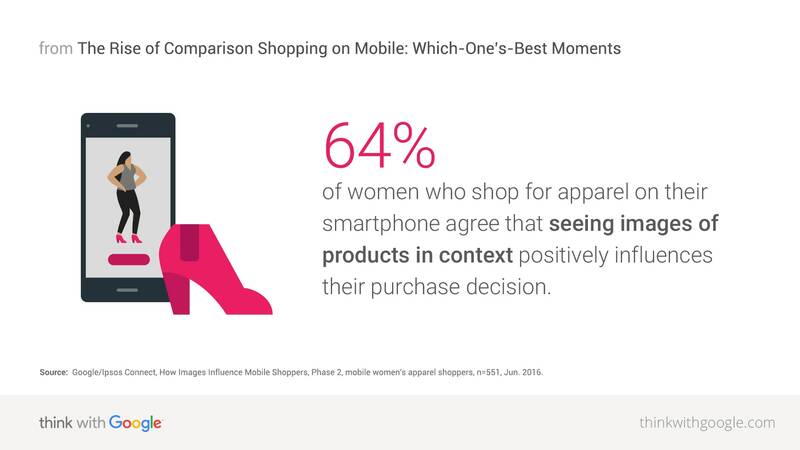 Source: Google/Ipsos Connect, How Images Influence Mobile Shoppers, Phase 2, mobile women's apparel shoppers, n=551, Jun. 2016. Show local availability of products. Six in 10 internet users check whether a product is available in a local store before visiting a store.8 Local inventory ads can help you turn comparison shopping into action by enabling people to see whether the exact product they're searching for is available in a nearby store. Global beauty retailer Sephora has taken steps to make the most of which-one's-best moments that play out in its store aisles. After observing that shoppers were turning to their phones mid-shop, the retailer realized that shoppers weren't necessarily price comparing—they were searching for product ratings and reviews online before they put something in their basket. Sephora built their app experience around this insight, allowing customers to scan products to read consumer ratings and reviews, view purchase history to remember the exact shade of a product they already have, and save loyalty information so they can earn points and redeem for gifts. There's a lot more to learn. Check out this more detailed feature on Sephora's approach to which-one's-best moments, including a video complete with interviews from the people driving this thinking for the brand. Consumer electronics retailer Best Buy faced a different challenge. As the nature of consumer electronics has gotten more complex, so have the questions that shoppers ask of the famous Blue Shirts. For example, today customers come into the store and say, "I want to stream photos from my SLR camera, onto my television, from my phone." They want to understand how products interconnect to make their lives better. To address this need for more information, Best Buy shifted its broadcast budget to digital where they can scale information more easily. The brand now uses ads that surface product availability in stores closest to where the customer is searching. The brand also created mobile buying guides on its site and on YouTube. Last holiday, Best Buy saw that local inventory ads, which surface the availability of products in-store, drove over 1 million store visits.The brand also found that mobile Shopping ads on Google outperform television in terms of return on investment. There's a lot more to learn. Check out this more detailed feature on Best Buy's approach to which-one's-best moments, including a video from Best Buy's Chief Marketing Officer. 1 Google/Ipsos, Consumers in the Micro-Moment, Wave 2, U.S., n=1,005, based on internet users, May 2015. 2 Google Data, U.S., apparel, home & garden, beauty & personal care, computers & electronics, and gifts, May 2015 vs. May 2016. 3 BrightLocal, "Local Consumer Review Survey," 2014. 4 Google Data, U.S., view count growth, classification was based on public data such as headlines and tags, etc., and may not account for every type of review video available on YouTube, Apr. 2015 vs. Apr. 2014. 5 Google/Luth Research, U.S., methodology: Google partnered with Luth to analyze the digital activity of its opt-in panel participants during a one-month, live-tracking study. This article details the cross-device clickstream data of one of those participants. Kaitlyn is a pseudonym. The participant agreed to the publication of this research for marketing purposes under the condition of anonymity. 6 Google/Mindswarms, U.S., methodology: Google partnered with Mindswarms to select and interview the participants of this live-tracking pilot study. The participants answered questions about their shopping behaviors and digital activity via video. 7 Google/Ipsos Connect, How Images Influence Mobile Shoppers, Phase 2, mobile women's apparel shoppers, n=551, Jun. 2016. 8 Google/Ipsos Connect, GPS omnibus, U.S. online respondents 18+, n=2,013, Mar. 2016. 9 MobileRQ, "How to Use Mobile to Increase In-Store Traffic," Apr. 2015.